Genetically engineering mosquito’s to kill their offspring before adulthood sounds like science fiction. On Sunday, however, just this happened when Oxitec showed recent signs of initial success after releasing their genetically modified mosquitos into the wild. With their success brings about doubts about if genetically modifying animals to die off is really “healthy” for the ecosystems they inhabit. These concerns are serious because once a genetically modified insect is released it is practically impossible to just catch them and take them back into the lab. With this advancement, scientists hope to create an age where genetically modified insects can be used to help control agricultural pests and control or limit the amount of wild insects that carry harmful diseases. Authorities in the South end of Florida plan to conduct a test on the genetically modified mosquito’s in the wild as early as December but are waiting for permission from the Agricultural Department. “I think that it has potential to create a few situations where insects reproduce too fast and they end up with more insects with the modified gene than what is safe for their species,” said Erick Dutchess, a Penn Manor Biology teacher. If these tests turn out a success, then it is believed that genetic engineering insects can be used to control other agricultural pests like the Mediterranean Fruit Fly and the Medfly. In Yuma, Arizona, there was a release of millions of genetically altered Pink-Bollworms into the cotton fields to try and reduce the amount of Pink-Bollworms destroying the cotton fields. However, Oxitec has been under fire for rushing their new genetically engineered insects out to field test without more lab tests. Oxitec made the Aedes aegypti mosquito’s which are the main carriers of the Dengu and Yellow Fever viruses. They released these mosquito’s into the Cayman Islands in the Caribbean, Brazil, and Malaysia with known success in each environment. 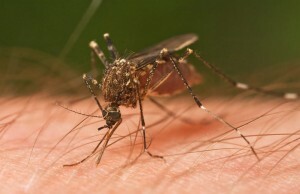 “I think it is about time we started killing off mosquito’s they are just annoying to deal with and carry unwanted diseases,” said Logan White, a Penn Manor senior. The effects that this will have on the ecosystem could be nothing, but it could be devastating but we won’t know for sure until more research is done along with more field tests. In the end time will tell if the genetic engineering of insects is harmful or helpful.